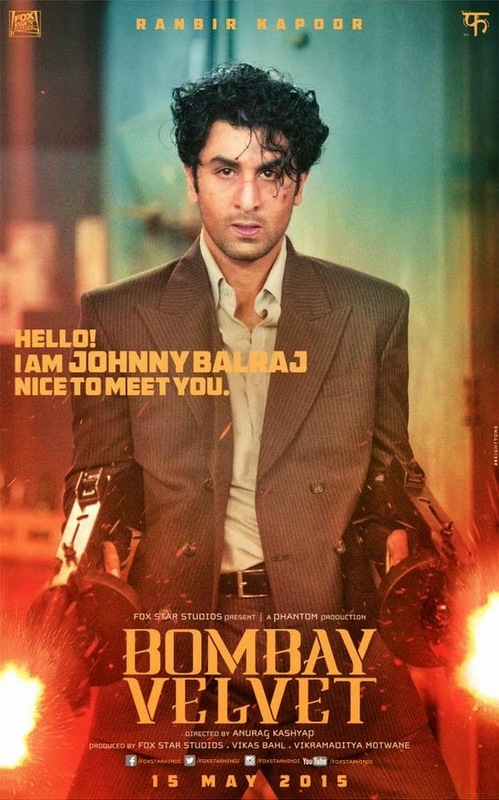 The first poster of Bombay Velvet is revealed today which shows Ranbir Kapoor as a daredevil Johnny Balraj. The much awaited poster of Bombay Velvet gives an intro to Ranbir’s character as a boxer and street fighter. Bombay Velvet poster reads: "HELLO! I AM JOHNNY BALRAJ. NICE TO MEET YOU." The movie's leading lady, Bollywood actress Anushka Sharma, who plays a jazz singer, tweeted that she likes the first look, first poster and another Bollywood actress Raveena Tandon, who will also be seen in the film as a jazz singer tweeted "saw BombayVelvet!It's fantabulously better than what expected!Well done team!take a bow Phantom!Ps(I look smashing )hahahaha anuragkashyap72"